Revs: KΛ EY, Nike advancing left holding wreath. Pomegranate in field. Revs: SELEYEWN KAI THSIEPAS AVTONOMOV, Thunderbolt, two pilei above. Obvs: No inscription. Tyche wearing turreted crown, palm behind shoulder. 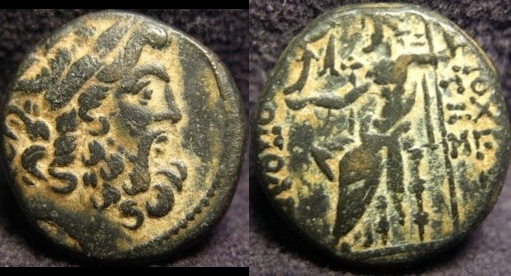 Revs: Poseidon seated on prow of galley holding wreath and resting on trident. Athena before. 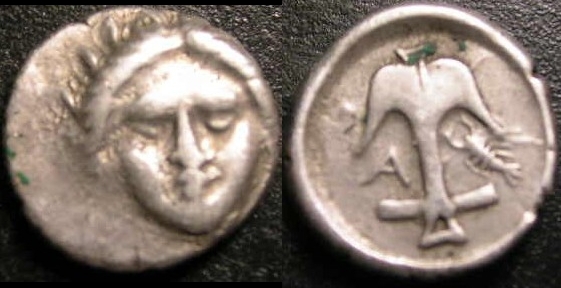 Phoenician date below. Revs: LPLMEWN THSIEPLS KLILSYLOY(Greek letters), Thyrsos Delta T in field. Revs: LPLMEWN THSIEPLS KLILSYLOY(Greek letters), Elephant right, H in field. MM in ex. 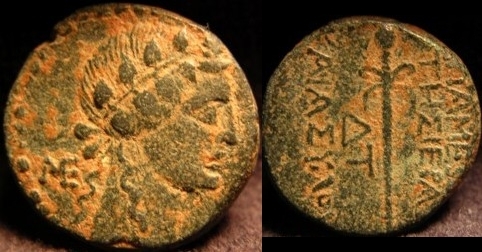 Revs: APAMEWN(Greek letters), Zeus standing left holding Corinthian helmet and scepter. Å p, palm countermark to left. 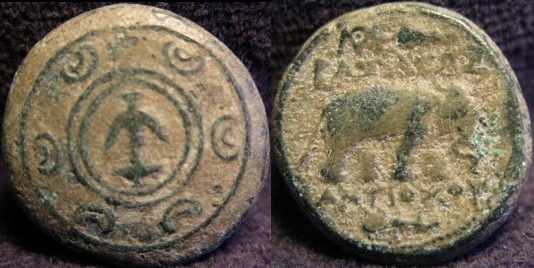 Revs: VICTORIAE LEATAE PRINC PERP, two Victories holding shield inscribed VOT PR on alter. Obvs: No inscription. Macedonian shield, anchor on the boss. Revs: BAΣIΛEΩΣ ANTIOXOY, Elephant right. Obvs: No inscription. Laureate head of Apollo right. Revs: BAΣIΛEΩΣ ANTIOXOY, Tripod. Anchor countermark right, bow to left. Revs: Incuse square of mill-sail pattern. Obvs: No inscription. Head of Herakles right, clad in lion's skin. 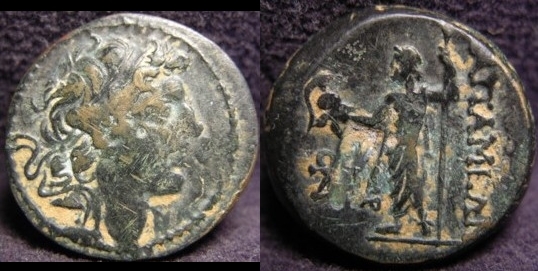 Revs: ALEXANDPOY (in Greek letters), in field to right with Zeus seated holding eagle and scepter. 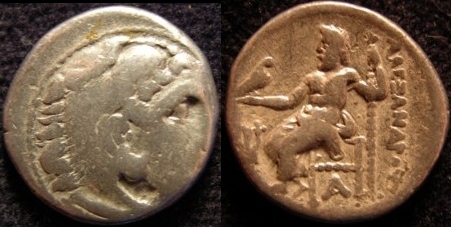 Revs: ALEXANDPOY (in Greek letters), in field to right with Zeus seated	holding eagle and scepter. A in exergue. Revs: ALEXANDPOY(Greek letters), Club above. Quiver/bow below, star to right. Obvs: No inscription. 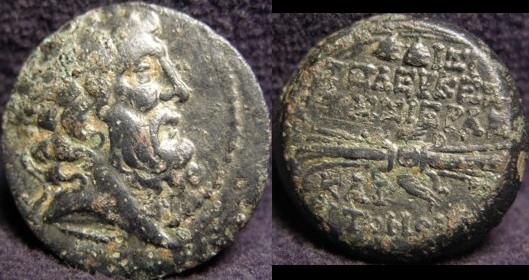 Laureate head of Zeus right within dotted border. 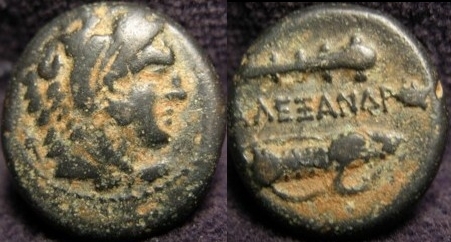 Revs: ANTIOXEWN THS MHTPOPOLEWS(Greek letters), Zeus seated left holding scepter and Nike. 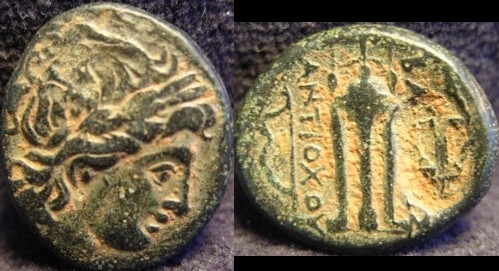 Revs: BASILIEWS ANTIOXOY EYEP3ETOY(Greek letters), Head-dress of Isis. Crescent DoP in ex. 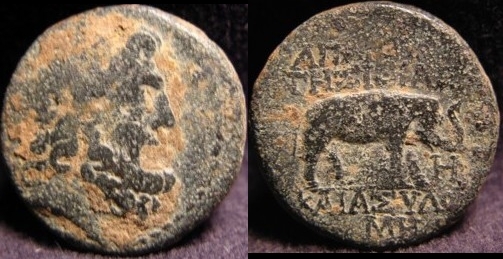 Obvs: Head of Antiochos right diadamed. Revs: BASILEWS ANTIOXOY FIOPATOPOS(Greek letters), Winged thunderbolt. Monogram below. 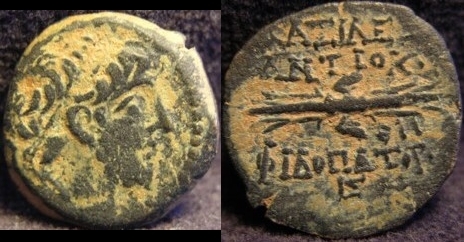 Revs: BASILEWS ANTIOXOY TYPIWN(Greek letters), Galley Phoenician characters below. 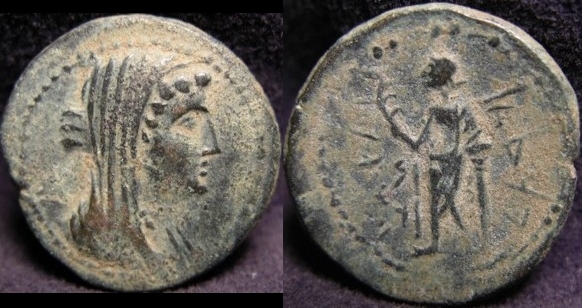 Obvs: Demetrius right diademed with short beard. Fillet border. Revs: (BAΣIΛEΩΣ) ΔHMHTPIOY NIKATOPOΣ, Agathos Daimon and Agathe Tyche confronted holding cornucopiae and clasping hands. Δ center, H to left. 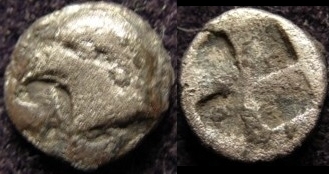 Revs: Phoenician inscption, Marathos standing holding in right arm aphlaston, resting elbow on column. 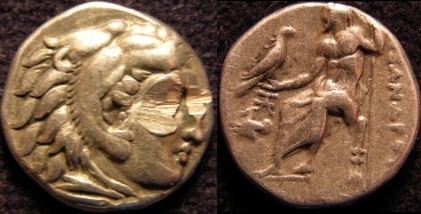 Pheonecian date to left. Obvs: IOVI CONSERVATORI, Jupiter seated holding globe and scepter.